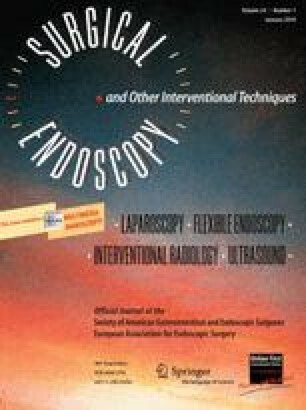 To evaluate our “laparoscopy first” (LF) approach for patients affected by gallbladder/CBD stones (laparoscopic exploration and intraoperative decision whether to proceed with laparoscopic CBD exploration or to postpone CBD stone treatment to a postoperative endoscopic retrograde cholangiopancreatography [ERCP]), we performed a retrospective, two-center case–control comparison of the postoperative outcome for 49 consecutive patients treated for gallbladder/CBD stones from January 2000 through December 2004. The results obtained with this LF approach were compared with those achieved with the traditional, “endoscopy-first” (EF) approach (ERCP plus endoscopic sphincterotomy, followed by laparoscopic cholecystectomy). The mean follow-up period was 6.4 years (range, 4–8 years). Native English speaker translation was performed by Kathleen Page Jones (email: 0521830398@iol.it).